Teaching Activity. By Bill Bigelow. 23 pages. The U.S. Constitution endorsed slavery and favored the interests of the owning classes. What kind of Constitution would have resulted from founders who were representative of the entire country? That is the premise of this role play activity. Most U.S. history and government textbooks present the Constitution as a kind of secular Ten Commandments: James Madison brought the document from the mountain and it was Good. The books may point out that not everyone agreed on the best plan for government, but through debate and compromise “Right” triumphed. What makes this treatment of the Constitution so pernicious is its effect on students. Removed from a social context, cast as an inevitability, the document is elevated to an almost holy status, above analysis and critique. This Constitution-as-religious-icon scenario doesn’t allow much wiggle room for student reflection. Instead, the teacher’s task is to enlist students in memorizing Constitutional wisdom: What’s meant by “checks and balances”? What’s a writ of habeas corpus? I’m sure I wasn’t the only student forced to learn by heart and repeat on command: “We the people, in order to form a more perfect union …” This is indoctrination, not education. The Constitution Role Play asks students to think critically about a number of issues that confronted the original framers of the Constitution. But the role play adds a twist: instead of including only the bankers, lawyers, merchants, and plantation owners who attended the actual Constitutional Convention, the activity also invites poor farmers, workers, and enslaved African Americans. This more representative assembly gives students a chance to see the partisan nature of the actual document produced in 1787. 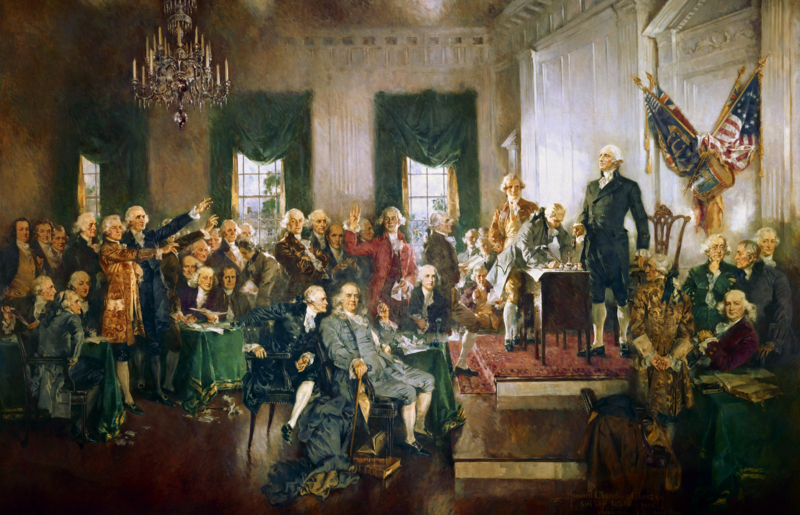 In the second lesson (The Constitutional Convention: Who Really Won? ), with the Constitution Role Play as background, students are primed to wade into the actual document and analyze parts of it in a social context. These lessons on the Constitutional Convention are among the most frequently downloaded from the Zinn Education Project website. We want to share your classroom story. If you use the lesson and tweet about it, consider tagging @ZinnEdProject. Teaching Activity. By Bob Peterson. 14 pages. A role play on the Constitutional Convention which brings to life the social forces active during and immediately following the American Revolution with focus on two key topics: suffrage and slavery. An elementary school adaptation of the Constitution Role Play by Bill Bigelow. Roles available in Spanish. Because both of these lessons [Andrew Jackson and the Children of the Forest” and Constitutional Role Play] revolve around groups who were (are?) traditionally silenced, they appealed to several students who often choose to listen rather than to give voice in the classroom. One girl, in particular, who is very shy and does not like to speak in class, chose to deliver part of the speech for her group as Enslaved Africans at the Constitutional Convention. It was a big moment. I just held the Constitutional Convention with my 8th graders this past week and this was the most successful role play I’ve done yet (I’ve been using the Zinn Education Project materials for about four years now). This time, students really embraced their roles–even those students with the most difficult task (the plantation owners and bankers, who, after some coaching, did not shy away from their arguments and beliefs as they did in previous years). The discussions got pretty heated at different points, but not so much so that we couldn’t reel things back in. There is much scientific evidence to support the idea that emotion is essential to learning, and this week’s role play is a good case in point. Students were talking about the convention outside the classroom, letting students in later periods know what was about to go down, so there was a lot of excitement in the 8th grade hallway and during PE throughout the week. Students were saying those magical words “this is fun” during the convention as well (and that is great praise from middle school students). I love the Zinn Education Project role plays because they give every student an opportunity to participate in some way. Even the students who are normally shy about speaking in front of classmates are at least engaged in the dialogue and writing notes furiously. I am a history teacher and I did this role play last year for the first time. It was hands down the best lesson I have ever taught. The material was accessible enough for all students to understand, yet also had them thinking on an incredibly high level. It beautifully illustrated why our government was structured the way it was–because the majority of people had no voice in its formation. I will always be incredibly grateful to the Zinn Education Project for producing this work. It was only about a month ago that I realized that it is on Facebook, and now I am really enjoying the daily updates. Thank you, thank you, and thank you.